If your dog has many ticks and they occurred the day you discovered them, then consider putting a tick collar on your dog right away. If your dog has a few ticks, then follow the directions below for removing ticks with tweezers or a tick removal tool. A collar for removing ticks from dogs that contains the insecticide amitraz (Preventic Tick Collar) will cause the ticks to fall from your dog. This will kill them immediately and cause them to fall off your dog before they take hold. Note that if you use this method, you'll have to clean your dog's bed daily to remove ticks that are falling off your dog. Also be sure to vacuum your dog's bed and surrounding areas to pick up any ticks. As an alternative, you can use a dip to kill ticks on your dog. You may need to use a tip once a week for 3 to 4 weeks to ensure all the ticks are killed and gone. Dips require a well ventilated space. As an easier alternative, consider having your veterinarian do the "dip" in their office. Protect your hands by wearing gloves when removing a tick such as latex kitchen gloves. Before removal, soak the area around the tick with hydrogen peroxide. This kills any bacteria on the skin. When removing a tick from your dog, use tweezers that have a thin tip. When you grab hold of the tick, do it as close to the skin as possible. 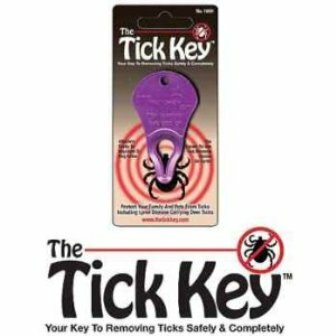 There are also tools you can buy for removing ticks from dogs such as the Tick Key (approximately $5). If using tweezers, grasp your tick near the head and pull straight from the body without twisting. Do not squeeze the tick if you can avoid it to keep more fluid from entering your dog's body. The entire tick should be removed with this method. 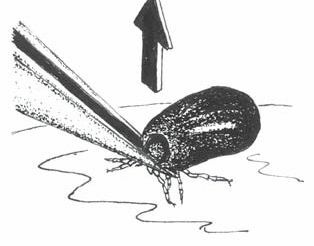 If the mouth breaks off the tick, because the mouth is deeply embedded into the skin, it probably means that the tick has already transferred some fluids. Don't be overly concerned, and just watch the area to make sure it doesn't become infected. If a bump develops where the tick was removed, there is no need for concern. This is a reaction to the tick and does not mean the tick is still on the skin. Watch the area for infection and treat the area with an antibiotic ointment. It should clear in 3 days or less. If it doesn't, call your veterinarian. When you are removing ticks from dog do not use a match, vaseline (petroleum jelly) or gasoline. These don't work. Be sure to clean the area of the skin where the tick was removed using an antiseptic, hydrogen peroxide, rubbing alcohol or antibiotic ointment. Place the tick into a alcohol filled container or a clear sealed container in case it needs to be tested for the presence of bacteria. Write down when you removed the tick for future reference. Watch your dog after removal for a period of 30 days to see if symptoms develop. As an extra preventive, consider having your dog wear a tick collar such as Preventic for use a topical spot on such as Frontline Plus.